A perfect morning in October, I found myself inside a beautiful renovated maisonette in Keramikos, along with 17 other beloved greek fashion bloggers, for the #followMI into a blogger's lifestyle photoshoot for MIGATO. It is the third season that MIGATO organizes a bloggers day photoshoot and the second time with Panos (see the first MIGATO bloggers day here). #followMI into a Blogger’s Lifestyle - the photo shoot’s intriguing concept - reflects typical everyday moments of a fashion blogger, according to each one’s personality and particular style. The photo shoot comes after MIGATO’s successful communication concept of #followMI which is an invitation to all #migatolovers to share photos with their favourite MIGATO items on social media. Naturally, we all did our own styling according to our personal style and based on our favourite shoes and bags from the MIGATO Autumn-Winter 17/18 collection, the talented make-up artist Vasilis from greek cosmetics company TommyG did our make-up and the uber-photographer Panos Georgiou took the shoots. Here I am having fun with lovely Sevastiana. You can read more about the photoshoot and see all the bloggers' photos at the MIGATO blog here and shop all our goodies at the MIGATO bloggers lifestyle product list here. Cream lace top and leather skirt, ALE. 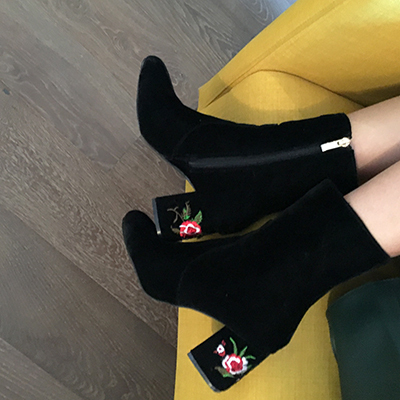 Black velvet booties with embroidered block heel and clutch bag with attached ring, MIGATO.